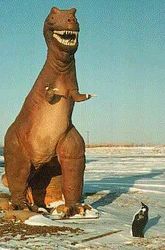 Children on a fossil hunt have discovered the remains of what may have been the biggest penguin to waddle the planet. The Traveling Penguin in New Zealand. The remains were found last month near Kawhia and are thought to be 40 million years old. Experts think it may be the finest example of the long-extinct bird found. 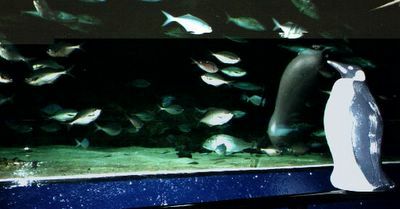 They say the Kawhia giant dwarfed the huge emperor penguin, and had it lived today would have looked many men in the eye. The 22-strong expedition from the Hamilton Junior Naturalists Club were out to find fossils for a natural history museum at Te Kauri Lodge, near Kawhia, when one of them noticed what looked like several bones sticking out from a sandstone platform uncovered by the tide near Te Waitere in the Kawhia Harbour. Group leader and eco-guide Chris Templer had dreamed of making such a discovery since he began digging for fossils as a child. 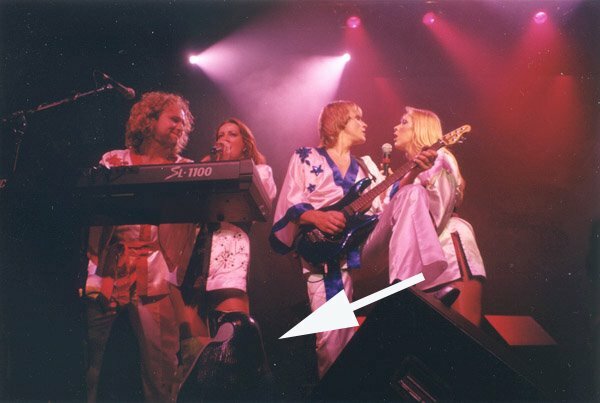 The Traveling Penguin on stage with BJÖRN AGAIN. It was several weeks before Mr Templer dared to move it and then only after consultation with Te Papa and local Maori. The sea was already starting to erode some material. "Within a matter of probably 18 months it would have gone or been unsalvagable. Alan Tennyson, curator of fossils at Te Papa, said the find could be internationally significant. Te Papa has only three bones from the largest ancient giant penguin. They were found near Oamaru by Charles Traill before 1872. 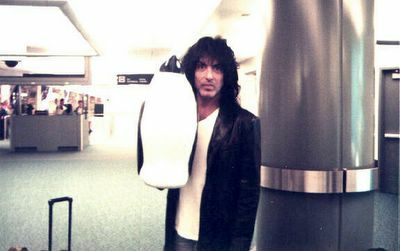 The Traveling Penguin with Paul Stanley of KISS. Scientists know of about 12 extinct penguin varieties in New Zealand, with most represented by only one or two fossilised bones. The completeness of the Kawhia find made it more valuable. So, where are all the penguin photos from? Why, The Traveling Penguin Site of course! Waaaay back when the palaeoblogger was starting his first adventures in the field he meet up with a mad motorcyclist named Brian Verch in Drumheller (where The Penguin(RT) is) who spend the better part of two summers helping to dig in the Centrosaurus bone bed (BB43) in DPP. Later Brian married the wonderful Bernie, acquired a penguin, and took of with it around the world. You can follow The Pengin's adventures and see some of the people it’s met HERE.